Great Fun - Slippery When Wet! This hot air balloon theme Jump n' Splash inflatable with slide and landing is a great way to cool off during the hot summer months. 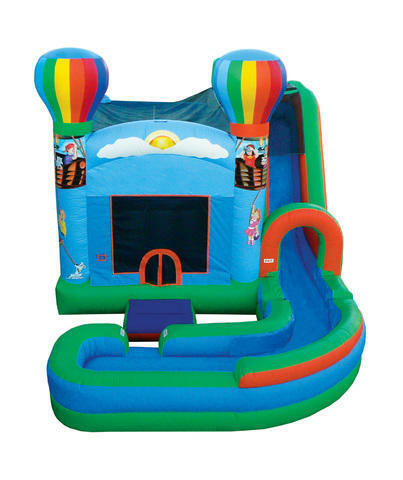 This unit has a large jumping area with exclusive Non-Slip vinyl for safe jumping. Climb up the ladder to the super wet slide that has more than 30 feet of sliding surface and whip around to the front. This Jump n' Splash unit will make any hot summer party an absolute home run. This bouncer slide combo was manufactured in the USA.